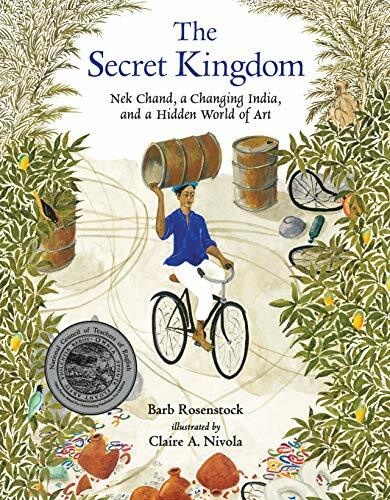 The Secret Kingdom is a beautiful picture book that tells the remarkable true story of a man who was uprooted from his rural childhood home in the Punjab when his Hindu family flees the Muslim violence after partition. “Nek became a farmer, part of the ancient cycle of changing seasons and shared stories. “Until the men with guns came. “The Punjab split into two countries: Pakistan and India. People of all faiths had lived together for ages, but now Nek’s village was in the Muslim country of Pakistan and his Hindu family no longer belonged. To support himself, Nek shovels gravel for road building. Eventually he finds work as a government road inspector in India’s first modern city, Chandigarh. As a child he had created miniature outdoor worlds with, “silt palaces and spilled waterfalls, molded clay goddesses and planted stick kings.” Now in his spare time, he begins to create a life-sized world, clearing the wilderness, building himself a mud hut, and planting a garden. With found objects he collected from around the city he made sculptures to embellish the garden, building his own secret kingdom. Nek’s 12-acre kingdom remained a secret for 15 years until a government crew stumbled upon it. Of course they reported Nek to the police. He was at risk of losing his job as well as having the bureaucrats destroy his creative work. The book climaxes with a gateway spread featuring a dramatic, double-page photograph of marching rows of sculpted animals in the Rock Garden, flanked on each side page with smaller photographs showing other scenes in the 12-acre garden. In 1976, the city promoted Nek Chand to director of the official Rock Garden in Chandigarh, which was then opened to the public. However, the travails didn’t end. In 1990, officials who objected to his recycled artwork planned to destroy it, but again the public turned out with hundreds of demonstrators forming a human chain to stop the bulldozers. Until his death in 2015 at age 90, Nek Chand spent each day at the Rock Garden, meeting with visitors, creating new plans, and supervising the continued construction of his kingdom. Rosenstock’s poetic, rhythmic telling of the story will touch the heart of readers young and old. This book celebrates the human spirit and humanity’s need for creative outlets, for special spaces, and for stories. Claire A. Nivola’s simple water color and gouache illustrations are the perfect partner to the delicate, spare text. Together the words and pictures make a beautiful whole.